"How do you establish the optimum altitude for the flight?" "Winds and temperatures are the two primary items in terms of establishing an altitude. Another is aircraft performance. Fuel consumption as well as true airspeed are affected by altitude. 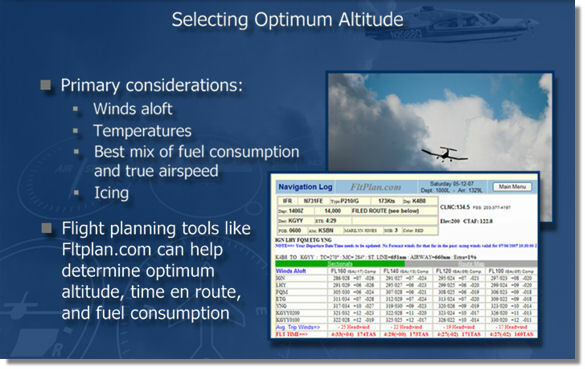 So it's important to select an altitude which will give you the best mix of fuel consumption and true airspeed. Additionally it's important to select an altitude where you'll be free of icing. Regarding the performance aspect, flight planning tools can help you along with this. For instance, FltPlan.com will oppose the projected wind numbers against your aircraft profile to develop for you time enroute as well as fuel consumption enroute. Regarding the icing issue, which most of us need to avoid, flying unprotected aircraft that are not certified for flight into known icing, requires that you have a good idea of whether icing is likely along the route of flight for the period that you'll be enroute. And you can do this by looking at temperatures aloft. 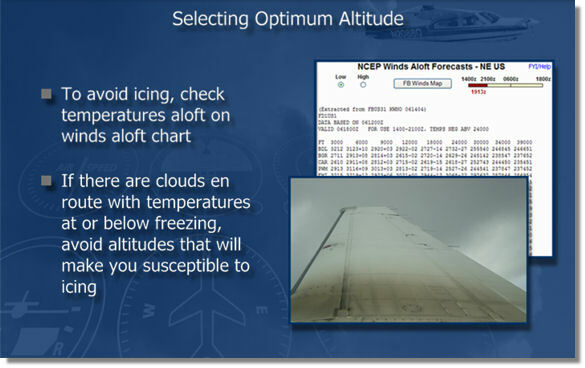 You can get these on the winds aloft charts and then decide on an altitude that will likely keep you away from icing. If you anticipate that you'll be flying through clouds on this flight and temperatures will be at or below freezing, you should take this into account in your planning to avoid altitudes which will make you susceptible to icing."